The glasses are nice. I’m sensitive to polarized lenses and I assumed this would work. If you are sensitive to polarized lenses it takes a while to get used to. Nonetheless the Rayban Justin’s are comfortable, nice and well worth it. Came as advertised. Love the look and feel of these Justin's. The rubberized frame is great for the abuse if you're active, clumsy etc... Very fashionable with the grey gradient lens. Polarized lens definitely does it's job here compared to the regular mirrored lens I also have. Would buy again! My husband is very pleased with these shades. The price was definitely less than it is in retail stores. They fit great on a round shaped face and the color is dark but not blacked out. The arms fit comfortably behind the ear and the frames are not to heavy on the nose. Good buy. Exactly as described. 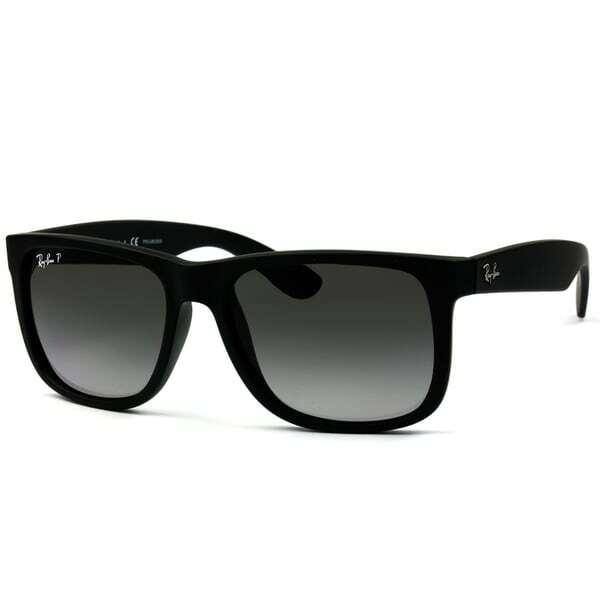 It is a nice matte black with the ray ban logo displayed. The gradient is a nice dark grey and looks really high end. Comes in ray ban box with leather case. Gave it to husband as a gift and he loved it! I have many New Wayfarer frames and I wanted to try something different, but not too much of a departure from the frame that I'm used to - the Justin is a nice compromise. It's different, but not too far from my comfort zone. However, I did not study the listing properly - these are a MATTE finish and I was expecting a nice glossy shine. I'll keep them. The price was too good to pass up. These are great sunglasses, the matte finish of the frames, the grey lenses and larger size. Happy with the product but hate the use of USPS for shipping, not only did their web site predict early shipment, then the original estimated shipment date, and then nothing....but 3 days late. When you order something, you want it when scheduled, if not earlier!!! Not only did this style look really good on my boyfriend but the price can't be beat.. trust me, I did my comparison shopping. I love how the lenses have a gradient to them. Shipping is so fast and returns are easy if the style doesn't suit you. Wasn't all that much cheaper than Nordstrom Rack but the only place where I found the black frame with grey lenses! Thanks overstock! The glasses are great but they were damaged in shipping process or something as they arrived broken. Love these glasses, perfect fit and beautiful style. I absolutely love Ray-Ban sunglasses!!! Quick shipping. I have ordered Ray-Ban sunglasses in the past and will defiantly be ordering more styles in the future from Overstock.com. These are just as pictured, polarized. Great price! Bought for my son for Christmas. They are authentic Ray Ban and they are polarized. He is very pleased with them. Awesome glasses and best price around. Love Overstock! Great fit. Covers the area around the eye to block side light. My husband absolutely love these! Beautiful shades!!! "Do the glasses come with the ray-ban case?" "what is the uv protection"
"Are these lenses glass or plastic?" the are glasses....they are the real deal!! 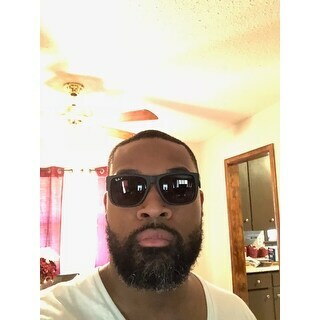 "Are these available with the black matte frame with the gray polarized lenses?" I bought these for my husband. They are a matte finish, my husband loves them! RB4165-55-622/T3 This is the item number from my original order. "Are these new Ray Bans?" "Does it come with a case?" Yes,these do come with a case.